There are a series of exceptional, world-class tourist attractions awaiting visitors to Pittsburgh. This is a large city and the scale of the attractions in Pittsburgh certainly match its status, with some of the biggest including America's National Aviary and the enormous Heinz Field baseball stadium. 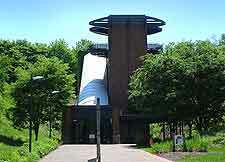 Founded in 1898, the Pittsburgh Zoo and PPG Aquarium and offers endless attractions for all the family. Covering almost 80 acres / 32 hectares and remaining open throughout the year, the zoo is visited by literally thousands of tourists during that time. Tourists wishing to learn more about the city's past should climb onboard the amphibious Pittsburgh Duckboats, or one of 'Molly's Trolleys'. 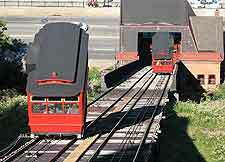 The Monongahela Incline is a historical railway which is actuallyally the most historical continuously operating funicular railway of its kind in the whole of America. Close to the light rail network and the Station Square station at Smithfield Street, the Monongahela Incline started its life in 1870 and remains popular today, leading up to the top of Mountain Washington. The panoramic views from the observation deck at the top of the hill are excellent and stretch across the Golden Triangle below. 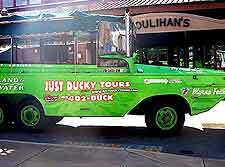 Resembling something crossed between a small bus and a boat, the Duckboat adventure vehicles start at Station Square, close to the Hard Rock Cafe, and take in the attractions around the downtown district, such as the Allegheny County Courthouse and the countless skyscrapers, before taking to the water and cruising down the river. Duckboats are actually genuine army vehicles and float just like a normal boat. Tours generally last around an hour and depart every hour and a half, or thereabouts. Situated within the Highland Park, the city's zoological gardens are called home by in excess of 4,000 different animals and around 500 animal species, including African elephants, Amur tigers, Grant's zebras, Masai giraffes, monkeys, polar bears, ring-tailed lemurs, sea lions and sea otters, along with birds, reptiles and invertebrates galore. Pittsburgh Zoo's outstanding PPG Aquarium opened as recently as the year 2000 and features state-of-the-art tanks and aquariums, with sharks and a marine environment within its Ocean Tank, a Stingray tunnel, and a flooded Amazon rainforest exhibit. 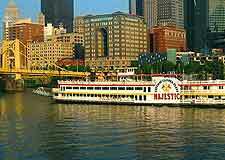 Established in the late fifties, the city's Mississippi-style paddleboats provide a relaxing way to sightsee along Pittsburgh's three rivers and pass plenty of interesting riverfront attractions along the way. Operated by the Gateway Clipper Fleet, these riverboats are simply enormous and come with enormous paddle wheels, being capable of transporting up to 1,000 passengers. Onboard entertainment and dining is on hand, with featured cruises including the comedy events, dinner cruises and dances. If baseball is your thing, then a trip to the Heinz Field is a must. This magnificent baseball stadium is situated within downtown Pittsburgh and is a relatively new addition to the city's sporting attractions, being completed in the summer of 2001, at the cost of almost $300 million. 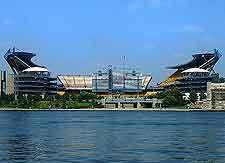 The Heinz Field is capable of accommodating over 65,000 spectators and is often nicknamed as the 'Big Ketchup Bottle', being the official home ground of the NFL Pittsburgh Steelers. Tickets for the biggest ball games and concert events should be purchased in plenty of time. To gain a very quick and pleasant overview of central Pittsburgh and the city interesting historical neighborhoods, do consider taking a ride onboard one of Molly's Trolleys. These popular trolley buses are very traditional in appearance and resemble those of the 1920s, taking in the main attractions around Mount Washington and the Duquesne Incline. Customized group tours are also available for up to 30 people. 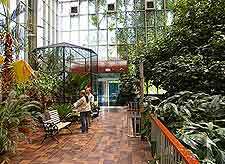 The Pittsburgh National Aviary is a vast indoor aviary and the biggest of its kind in the United States, being home to around 600 birds. Attractions are extremely varied and range from outdoor bird shows and, feeding displays, to personal encounters with penguins. Expect to see many unusual species, which are rarely display in other zoos and aviaries. The National Aviary's gleaming new education center regularly stages talks and presentations. If you are a lover of the theater and are looking for a good show, then it is very likely that the city's selection of theaters will be able to provide you will a memorable evening of drama, opera or classical music. The Palace Theater is amongst the oldest, being open since 1926 and accommodation audiences of just over 1,300 people. Slightly newer is the Benedum Center for the Performing Arts, which was completed in 1927 and is known for its elaborate Georgian-style interior. When the Pennsylvanian sun is high in the sky and shining down, tourists with children will find that the allure of the nearby Sandcastle Waterpark is difficult to resist. Located just a matter of minutes to the southeast of downtown Pittsburgh and within the suburb of Homestead, the Sandcastle Waterpark features enclosed dinghy slides, waterfalls, extreme body slides, a lazy river, an a wave pool known as the 'Mon Tsunami'. Younger children will enjoy the attractions at Wet Willie's Water Works, while by night, many tourists choose to hang out at the Sandbar, where themed nights have become somewhat of a specialty.